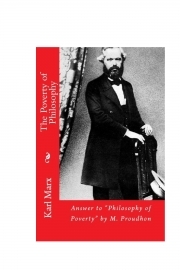 Description of "Poverty of Philosophy (eBook)"
In this work Marx critiques the economic (chapter one) and philosophical (chapter two) doctrine of P. J. Proudhon. Marx started work on this book in January 1847, as can be judged from Engels’ letter to Marx on January 15, 1847. By the beginning of April 1847, Marx’s work was completed in the main and had gone to the press. On June 15, 1847 he wrote a short foreword. Published in Paris and Brussels in 1847, the book was not republished in full during Marx’s lifetime. Excerpts from section five of Chapter Two appeared in different years, mostly between 1872 - 1875 in papers such as La Emancipacion, Der Volksstaat, Social-Demokrat, and others. In 1880 Marx attempted to publish the Poverty of Philosophy in the French socialist newspaper L’Égalité, the organ of the French Workers’ Party, but only the foreword and section one of Chapter One were published. Reviews of "Poverty of Philosophy (eBook)"